In its history spanning more than 130 years, American Major League Baseball hasn’t witnessed a single player cross the 800-run mark. While prolific sluggers such as Alex Rodriguez still hope to clinch the much-coveted record, here is a list of the careers of two supremely talented ball players who have hit 800 career home runs, in other leagues. 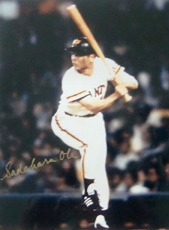 Playing his trade at first base, Sadaharu Oh was a left-handed batter and pitcher. Having initially signed with Yomiuri Giants – the powerhouse of Japanese baseball in 1959, his pitching skills were ignored as he was converted into a first baseman. Oh is popularly remembered for his unique “flamingo” kick, but his incredible achievement in the slugging department leaves many a ballplayer in awe. His talents were undisputed as he managed to raise his batting average from .161 to .270 in his debut season as a professional in 1961. Although the following year saw a dip in performances, the saying “Form is temporary, class is permanent,” applied. He went on to become the batting champion five times, and was also the highest scoring player for fifteen seasons, in the Japanese League. He claimed the MVP award in the Central League a record nine times, and was the first player to receive the People’s Honor title. A one-team man, Oh spent his complete professional career spanning 22 years with the Giants in Japan. In addition to his contributions as a player, he also managed the team between 1984 and 1988. He currently holds the world record for scoring the highest number of home runs in a baseball career (868). He also holds the record for scoring the most number of home runs in a single season, in the Japanese League (55). Heroes come and heroes go, but unsung legends raise an eyebrow every time they are mentioned. Joshua Gibson, arguably the best baseball player in US history, is one such person. Having started his career as a ballplayer in 1930, he represented the Homestead Grays for a season before switching to Pittsburg Crawfords, where he spent the next four seasons. Gibson’s allegiance was pledged to the Grays, and it became evident when the prodigal son returned in 1937. However, he had spells in the Dominican League with Ciudad Trujillo, and in the Mexican League where he played for Rojos del Aguila de Veracruz, for a season each in 1937 and 1941 respectively. Historians in the sport consider Joshua Gibson as one of the best power hitters and catchers of all time. It is said that the man would have taken the Major Leagues by storm, just as he did the African-American leagues. In 1972, he was inducted into the sport’s Hall of Fame. Although “Black Babe Ruth” was the nickname that popularized Gibson, many fans and followers of the game, who saw both Ruth and Gibson play, nicknamed the former as the “White Josh Gibson.” Gibson never featured in MLB due to an unwritten policy, which excluded non-white people from playing at that time, but his records of 962 career home runs and 84 homers in a single season are ones for the history books.